Khandro Tsering Chodron, 2004, Sikkim. Khandro Tsering Chodron was one of the most remarkable women I have ever had the extraordinary privilege to meet. Slight of build, her appearance betrayed a woman of great strength, loyalty and humility. I could sing her praises until the cows come home, but in the limited format of a blog, one must endeavour to be somewhat contained. In case you do not know her history, she was the consort of the great Tibetan Master, Jamyang Khyentse Choky Lodro. She came with him from Tibet in 1956, just before the take over by the Chinese in 1959. When they first arrived in India, they went on a long pilgrimage to many of the sacred places of the Buddha, but from 1957 they lived at the Palace Lhakhang just above the town of Gangtok in Sikkim. 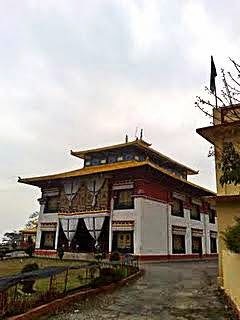 Khandrola continued to stay there after Choky Lodro passed away in 1959. She lived and practised in the simplest possible way, staying in the room that housed the relics of her Master. This room was in the southern, lower corner of the Temple, and here she would sit in her wooden meditation box, with just a few personal effects around her. I always had a sense of awe when I came into her presence and into this room. One could sense a very special atmosphere the moment one entered. The first time I saw her was in 1989 when she visited Dilgo Khyentse Rinpoche at his monastery in Nepal. It was evening, and there were not many people around. In fact, I seem to remember that it had been expected that she would come at a quiet time. She preferred it that way. At that time I knew very little about her and I had never met her, but it was apparent that she was no ordinary visitor. Khyentse Rinpoche had climbed out of the large wooden box, where he sat a good part of the day, and, taking a long white scarf, had gone to the door in order to greet her. This made a strong impression upon me at the time. The atmosphere on that occasion was saturated with a special silence, and the fact that he had gone to meet her seemed very significant. This did not happen very often and yet great Lamas from all the traditions of Tibetan Buddhism came to meet him in this room. When she appeared at the outer door, she cast a bright smile that shone like a beam of light into the huge hall-like waiting room outside Rinpoche's private chambers. A diminutive figure, clad in a simple dark chuba and wearing a little green woollen hat, which she quickly pulled off, careless of the fact that her hair flew out from under it like a silver halo. I clearly remember the hushed excitement and the joyful exchanges that soon took place between them. There was nothing extraneous or effusive in this exchange, but one clearly sensed the love and the profound regard which each felt for the other. This was a moving thing to witness and remains one of the precious memories I have from that time. In the year of 1996, I went with a Tibetan friend to Gangtok in Sikkim, to attend a Kalachakra Empowerment that was being enacted by H.H. Dalai Lama. One day, during a break, we climbed the hill to the Palace Lhakhang, and upon approaching the Temple, I noticed a number of wooden shelves with many flower pots and boxes directly outside the windows of one of the lower rooms of the Temple. What struck me most at that moment, was the fact that my favourite flowers were growing in many of the pots, and I had neither seen or smelt this particular fragrance since I had left New Zealand way back in the 70,s. The flowers were Freesias, and the effect of coming upon them like this, so unexpectedly, instantly bought tears to my eyes. It was an intensely poignant moment. It might appear to be perhaps a minor occurrence and yet it stopped me in my tracks. Standing outside those windows and bathed in the scent of these flowers I felt a sensation of coming into the presence of something deeply familiar. After making one complete round of the Temple, we came again to the doors just outside this room. My friend beckoned me to follow as he stepped inside and then lifted the curtain over a door on the left of a small passageway and then ducked inside. He had been very keen to meet with Khandrola. He was preparing to go into a long retreat in the mountains to the north of Kathmandu, and was anxious to receive her blessing before he went. His father and uncle had both met her on several occasions in Lhasa in the 1950s and they had great faith in both Choky Lodro and her. I was very eager to meet her myself. Khyentse Khandro had been the consort of my Master's, Master. In fact, Choky Lodro had been close to both Dilgo Khyentse and Chadral Rinpoche, the two most influential people in my life. These were strong associations and the sense of being in the presence of something deeply 'familiar' should hardly have been surprising. She greeted us with a bright and completely open smile. I have not met another woman who was as unaffected or as humble as she was. However, I was also profoundly struck by the atmosphere in that room. It was both subtle and yet, at the same time almost palpable. Soon after our arrival and exchange of greetings, a large group of visitors appeared. Khandrola quietly slipped away to the bathroom and we both instinctively knew that she would not reappear until the crowds had passed through and gone again, so we made our way out into the glistening sunshine, both of us deeply impressed by this brief encounter. After my first meeting with Khandro Tsering in 1996, I was not able to visit Sikkim again for several years. 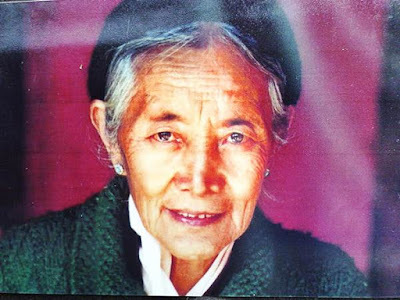 However, in March of 2001, I set off for Gangtok, eager to deepen my connection with Kandrola and spend time practising near her. 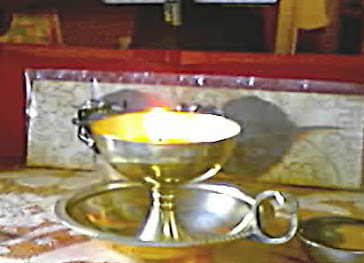 Soon after arriving, I found a pleasant room not far from the Palace, and as evening set in, took up a kadak and my small offerings and headed towards the Temple. It was a glorious, golden evening, and at that time, there were few buildings near the Temple, it stood alone in grand splendour, on an upper fold of the hill above the township. A small apartment off to one side, housed an old Lama, whom I found dozing quietly in a deck chair, around him, the inert bodies of three or four cats stretched out comfortably. As I made my first round of the Temple I came across Khandrola making her evening circumambulations, her faithful old mutt of a dog, trailing just behind. The only other people around were two ancient Tibetan woman, busy with their prayer beads and muttering mantras. Apart from them, the place was deserted. Khandro greeted me with a beautiful smile and asked what I had been doing all the years since my first visit. I was very surprised that she remembered me, I fell into step with her and we exchanged a few sentences. I told her I had come in order to spend time practising in and around the Temple, saying nothing of my desire to just be in her presence. I knew very well that, being as reticent as she was, she would not encourage that. After my brief explanation, she nodded her head in approval and bade me to follow her into her wonderful room. That evening everything unfolded with such ease and naturalness that I immediately felt at home and extremely happy to have made the decision to visit in this way. Over the next ten days, I rose early in the mornings and went up to the Temple. Khandrola was often outside making her rounds, and we always exchanged some words. Although I was spending a lot of time up there, I always went on with my practice, and in this way, I had many unplanned and wonderful interactions with her. Simple sharings, spontaneous and in many cases very joyful. It was a teaching in itself, just to be near her, the whole atmosphere around her was quietly charged. Since my Master, Khyentse Rinpoche's passing I had not felt such an effortless intensity. I found this to be a tremendous support for my sadhana. Without even trying to request teachings or have any expectations what so ever, everything simply unfolded in a completely spontaneous and natural way. Often I would sit under this small canopy not far from her room. 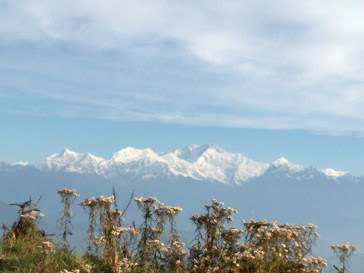 From this place, one had a sweeping view of Kanchendzonga to the west and a whole series of mountains to the north. Many times she joined me there, and she would ask me things or share little stories, or we would just sit together in companionable and easy silence. She never baulked at my atrocious blundering and efforts to communicate in the Tibetan language, but instead was always encouraging and helpful. Sharing many experiences and insights, just as they would arise in her mind. I felt so utterly blessed. I would watch the locals coming up, many in their gym shoes, striding around the Temple at twenty miles an hour. They were of course very aware of Khandrola, but for most of them, she was simply part of the beloved and familiar landscape of that place. They were preoccupied and involved with their own thoughts and schedules, mindless of the living treasure in their very midst. Kandrola had such a pervasive sense of the ordinary about her, that one could easily forgive their seeming indifference. She who knows, but does not show... Hers was the quiet evanescence of realization, that, due to her natural reticence and humility were often overlooked by those who did not know her well. In every sense of the word, Khandro Tsering Chodron was a 'hidden yogini', a practitioner of the highest order, who never, in any way put herself forward to the world. And certainly, the 'world' around her just went on with its own day to day business, while this luminous being graced them with her presence. Between 2001 and 2006 I visited Khandro, three or four times a year. I would stay several days and on a number of occasions was also able to attend the ceremonies that would take place in her room from time to time. In April of 2006, Sogyal Rinpoche was present and we were all able to celebrate a wonderful Guru Rinpoche Feast Offering together in that room. At that time, I had no idea that I would not meet Khandrola again. I received a phone call early one morning, a few months later, with the news that she was unwell, and although my instinct was immediately to go to Gangtok, her assistant, who had phoned me, told me to wait a few more days, and he would call me when things settled down. However, Dzongsar Khyentse Rinpoche, (the Tulku of her former Master Jamyang Khyentse Lodro) arrived that very evening and it was quickly decided that he would take her to Delhi for medical tests. Soon after that, the sacred remains of her Master Khyentse Chokyi Lodro were moved to Bir, where she stayed for a while until leaving for Lerab Ling in France, where she recently passed away. Her life was one of quiet, focused and very dedicated practice. There was nothing superfluous or showy in her manners or appearance. Having the extraordinary good fortune to observe her on many occasions, I was able to witness something that was very special and unique. She had a strikingly penetrating way of looking at people. It was very fleeting, but one felt that in that short moment she perceived clearly, the whole panorama of the life of the person she was seeing. She did not miss a thing. Acutely aware, she had the sword like qualities which alone, cut through all outer trappings and uncover the very heart of things. How wonderful... the signs and symbols, always present everywhere. Yet in the proximity of Wisdom Beings this can get so striking that one is thrilled or / and moved to tears.